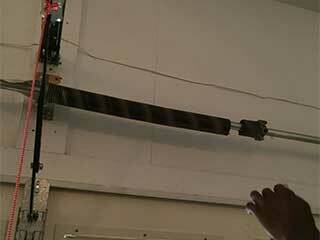 What makes the garage door springs so important? They hold force equal to the door’s weight so when the unit is closed, they keep it balanced. When the door opens, the force is released and used to lift the panels accordingly. As you can see, without these crucial components, your system will barely be able to move. Due to the nature of their operation, springs suffer from a great deal of wear and tear damage over time, and will eventually break. However, there are a few ways to prevent that, or at the very least prolong their lifespans and ensure they operate effectively for as long as they can. Whether you have torsion or extension springs, you need to check them carefully for any signs of damage like scratches and deformed coils. Remember to check the hardware components linked to them just to be on the safe side. If your spring system uses safety cables, make sure that they are in good shape and that they are properly attached. Don’t underestimate the importance of routine inspection as it is a primary maintenance task, and can make all the difference as far as ensuring safety is concerned. The next task you should take the time to perform is testing the springs to determine how well they are doing their job, i.e. are they properly counterbalancing the door while it's moving. Open your door halfway. If the balance is right, it will stay in place or move just a bit in either direction. It won't be tilting to one side, and it certainly won't begin to slowly close. If there is too much tension in the spring system, the door will jump up. If there is too little tension, it will drop down. In either of these cases, getting them professionally adjusted will be necessary. You should get this done as soon as possible. Any spring related issue makes your system dangerous to operate, and since these components are dangerous to handle without the proper training, you should always seek out professional assistance when faced with such a scenario. As opposed to the extension type, torsion springs twist and unwind rather than stretch and contract in order to do their job. As a result, there is friction between the coils, which can be heard as that annoying squeaking you're probably all too familiar with by now. To reduce that friction, and that annoying sound, you could lubricate your springs on a regular basis, perhaps once or twice a year. This will help to extend the lifespan of not only your springs but the rest of the system as well. It's always best to have professionals deal with any spring related problem you are experiencing. Our team at Garage Door Repair Simi Valley is the best service provider in California.